Now that we have some light pipes available, courtesy of the Glove device, we can try to use them to make some simple shapes. It's Valentine's Day! So let's go for some MWM hearts for our Valentine. I grabbed a heart shaped clip art from all-free-download.com. That object was stretched horizontally a little to fill up a bit more space and utilize more of the pipe length. 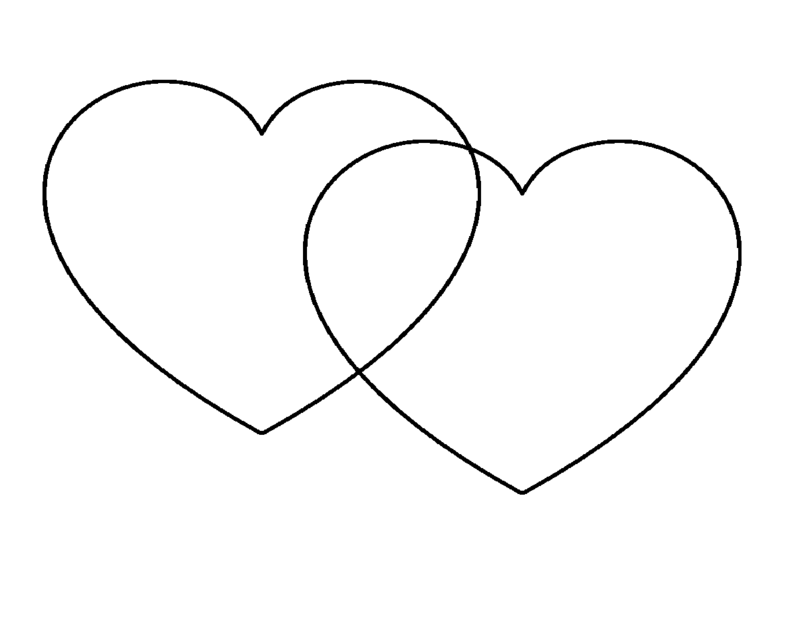 That heart shape was copied, pasted and dragged into place to make two overlapping hearts. The result was printed onto a sheet of paper and a quick check was made to make sure the plastic pipes would easily make it through the foam board and around the perimeters of the hearts. Click here to download a copy of that template. A picture frame from a Thrift Store was still hanging around from Halloween. It's insert dimensions are 13x10" - larger than the paper template - so it works. The glass and the matting were taken out. A piece of 3/16" thick foam board, with a black paper surface, was cut to fit that opening. The paper template was laid out over the foam board where it seemed like a good spot to position the hearts. A ballpoint pen was used to trace the outline of those hearts, pushing hard enough to leave an indention in the foam board below. The paper was removed and set aside. A phillips screw driver was used to make holes in the foam board where each of the hearts come to a point. It was slowly enlarged until big enough for two light pipes to pass through from the back side. Check out the picture on the right. After pulling the pipes through the holes, the next task was stick them in place over the heart traces. Black, low temp hot glue was used to try to tack them down. However, the pipes strongly resist being bent into new positions. The attachment points kept pulling up. I had to resort to using tape to hold the pipes in shape while hot gluing the pipes to the paper surface in the gaps between the tape strips. That worked, but the paper facing bound to the tape too strongly in places and ripped off when the tape was removed. A better way to hold the pipes in position and/or a stronger, quicker acting adhesive would be a welcome improvement. The original plan was to use mounting tape to hold the battery compartment and the circuit board flat on the backside of the foam board. That didn't work out too well. To get sufficient light to go through the pipes, the LED has to line up directly beneath the end of the pipe. When the circuit board was mounted on the foam board, it caused too much twisting of the connections and not enough light made it through. So the board had to be removed from the backing and allowed to float free to give the minimum of pipe twisting. Once all that was worked out, the assembly was mounted in the picture frame. The effect worked OK. With better alignment of the LEDs and ends of the pipes, it would have been even better. 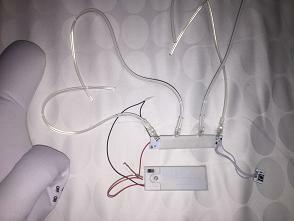 Ideally, the LEDs would be removed from the circuit board and reconnected with wires such that the positioning of the LEDs and pipes could be optimal. Another improvement would be to redo the IR receiver connections. With minimal manipulation, a couple of the wire connections came loose. Those wires are really fragile! Attaching better, longer wires with some sort of strain relief would be a welcome improvement. That would allow repositioning the IR receiver to the edge of the frame to make signal reception a lot better than is possible with the receiver in the back. A good deal of light comes out the back as there's nothing to prevent that from happening. I actually liked that effect. Putting a layer of black cloth over the back cut out most of that. So that would be an option, if so desired. So there you have it. A first attempt at using the glove device's light pipes to form shapes. The outcome wasn't too bad! Lots learned. Things that could be improved upon. If you give it a go and come up with something interesting, be sure to register and drop us a line about your hack. Seems like this MWM-light pipe combination has a lot of potential. Probably true for side glow fiber optic strands, as well.